I started off with a basic cheesecake recipe and dressed it up with some blackberry jam and a wonderful crumb topping. Who would have thought this would be such a winning combination. Preheat oven to 350 degrees.. Mix all ingredients together and press evenly across bottom of a 9 inch spring form pan. Bake for 8 to 10 minutes; cool and fill. Beat cream cheese and sugar until smooth. Add eggs one at a time, beating after each addition. Add sour cream and mix again. 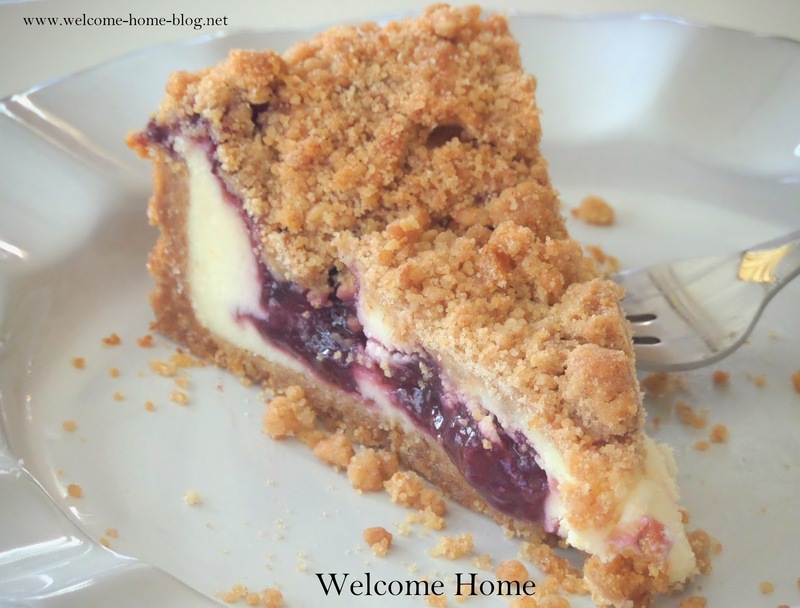 Pour half of mixture into crust and drop dollops of blackberry jelly on top. Pour remaining cheesecake mixture on top and smooth the top. Bake for 1 hour and 5 minutes. Turn oven off. 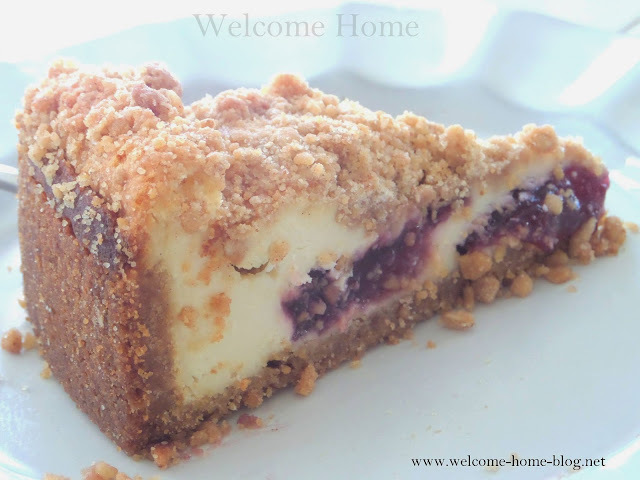 Sprinkle crumb topping (recipe below) on top of cheesecake and return to the oven for another 10 minutes with oven off. In a medium bowl, stir together brown sugar, flour, cinnamon and salt, until combined; knead in butter using fingertips or a fork, until ingredients are well incorporated and start to clump together. 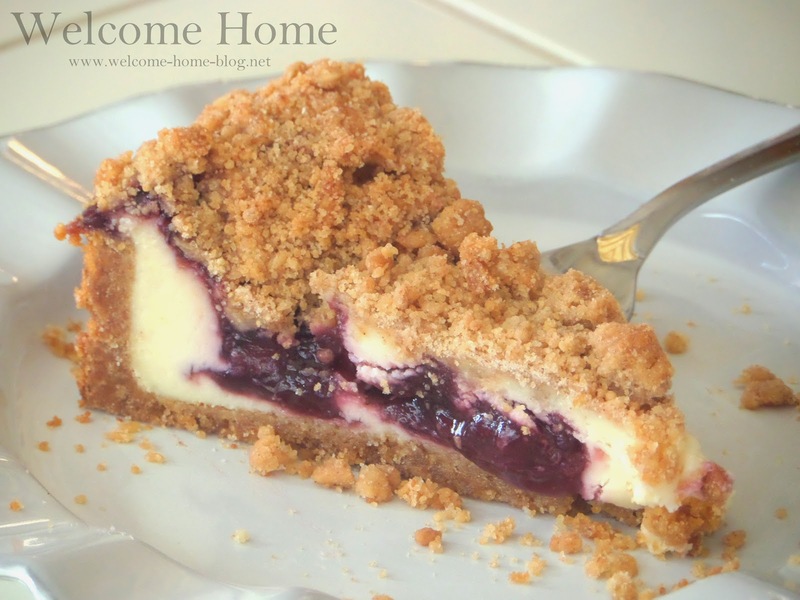 Sprinkle the crumbly mixture evenly over the cheesecake filling. Return pan to oven and for an additional 15 minutes with oven off. Cool for an hour before removing ring. Then chill for at least another hour or two before slicing. I cannot wait to make this! It looks so very yummy!! !